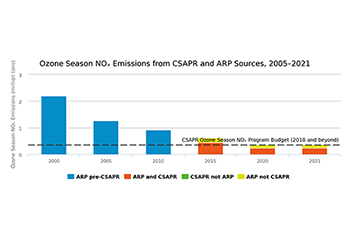 Ozone season NOₓ emissions have declined dramatically under the ARP, NBP, CAIR, and CSAPR programs. These reductions have occurred while electricity demand (measured as heat input) remained relatively stable, indicating that the emission reductions were not driven by decreased electric generation. These emission reductions are a result of an overall increase in the environmental efficiency at affected sources as power generators installed controls, switched to lower emitting fuels, or otherwise reduced their ozone season NOₓ emissions while meeting relatively steady electricity demand. 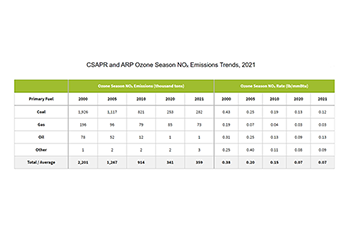 Other programs—such as regional and state NOₓ emission control programs—also contributed significantly to the ozone season NOₓ emission reductions achieved by sources in 2016. 30,000 tons lower (7 percent reduction) than in 2015. In 2016, CSAPR NOₓ ozone season program emissions were 33 percent below the regional emission budget of 628,392 tons. 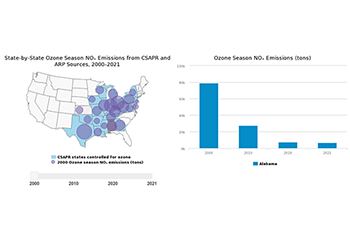 Between 2005 and 2016, ozone season NOₓ emissions from CSAPR sources fell in every state participating in the CSAPR NOₓ ozone season program. Twenty-three states had emissions below their CSAPR 2016 allowance budgets, collectively by about 210,000 tons. Two states (Louisiana and Missouri) exceeded their 2016 budgets by about 3,900 tons combined. In 2016, the average NOₓ ozone season emission rate fell to 0.09 lb/mmBtu for CSAPR ozone season program states and 0.10 lb/mmBtu nationally. This represents a 50 percent reduction from 2005 emission rates, with the majority of reductions coming from coal-fired units. Although heat input has decreased slightly over the past 11 years, emissions have decreased dramatically since 2005, indicating an improvement in NOₓ emission rate. This is due in large part to greater use of control technology on coal-fired units and increased heat input at natural gas-fired units, which emit less NOₓ emissions than coal-fired units. Nitrogen oxides are made up of a group of highly reactive gases that are emitted from power plants and motor vehicles, as well as other sources. NOₓ emissions contribute to the formation of ground-level ozone and fine particle pollution, which cause a variety of adverse human health effects. The CSAPR NOₓ ozone season program was established to reduce interstate transport during the ozone season (May 1 – September 30), the warm summer months when ozone formation is highest, and to help eastern U.S. counties attain the 1997 ozone standard. 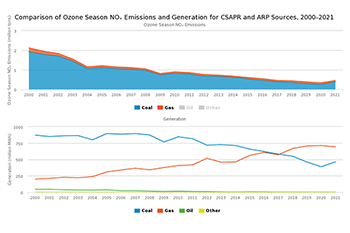 In general, the states with the highest emitting sources of ozone season NOₓ emissions in 2000 have seen the greatest reductions under the CSAPR NOₓ ozone season program. Most of these states are in the Ohio River Valley and are upwind of the areas CSAPR was designed to protect. Reductions by sources in these states have resulted in important environmental and human health benefits over a large region.